I love the "year in review" stuff on New Years, it helps remind you exactly how much has happened this year. Spent time in Waxhaw, NC. Saw snow, made a snowman, received training. Celebrated boxing day in a Korean home, and a Finnish home. Calvin discovered a love for running and soccer. Sydney blossomed as a social butterfly in many cultures. German, PNG, Finnish children in our yard is a daily thing. Had a jungle adventure at POC, did lots of hiking and learning. Went to exotic new places like Lae, Madang, Alotau, Port Moresby, and Australia. It's been such a great year. Words don't really accomplish the task of communicating the fulfillment that comes from looking at the last year of your life and realizing it's been your best year yet. I had thought for a long time my best years were behind me. Many people tell you "college will be the best years of your life." and I think personally, that life keeps getting better when you're following the will of God. Marriage, children, family, and the blessings keep coming. and for strength for the next year that we would be able to overcome the challenges and be aware of the opportunities, and ever mindful to be thankful for both. We made a 20 minute small video you can watch or downloadof our Christmas. if you download the video, you can expand it to make it larger, it's small so that it didn't take us long to upload. This is for everyone we'd normally see at Christmas, and everyone who helped contribute to us being here and everyone who helped to make our Christmas great! CLICK HERE FOR THE VIDEO - it's best if you right click on the "click here" to save it. tonight we were invited to celebrate "finnish porridge"
it is meant to be a christmas breakfast dish, but they got started late. if you find a hidden almond you get to make a wish. he found the almond, and began to chew it when his mom said "what did you find?" we all laughed, he missed out on his wish! it was very pleasant talking about their traditions on Christmas. Sydney liked the porridge, she ate two bowls of it. I was honored to be invited, although we had plans to be elsewhere we found a way to squeeze them in. Their traditional christmas dinner is a huge ham, but they are doing turkey this year. They performed a chapel for us last week part of their tradition. Traditionally they ask for alms at the end. IT's a play about Herod and his decree to kill the boys under 2 and a soldier who defied him. An unexpected treasure found on Christmas Eve. and now, the new year's eve party. Got home from our celebration with friends and it's 7pm the kids say "we got to get to bed quick! Santa's coming"
and we figure since PNG is on the edge of the map, we're sometime after russia. Sure enough Santa left Kamchata Russia moments ago, and is now flying over the blue ocean. The kids were scared, they ran and jumped into bed! They're odd ducks in some ways. Christmas Eve the kids were acting excited as kids do, and as parents do, we used the Santa ploy against them. "What kind of flag would you use?" That sent Kendal and I into laughter but Calvin really wanted to know. "I'll use a PNG flag buddy." "I bet no one else in Ukarumpa has a light saber like this." and I replied "well, not any more." Kendal and I chuckled over that. The kids weren't phased at all by the fact that a few of their gifts were used. I doubt they noticed. We were amazed at the generosity of everyone this season and feel overwhelmed with honor and gratitude that this Christmas morning was so enjoyable! My Daughter is slightly evil. She decided to leave a christmas cap at the base of the fireplace to trick me into believing that Santa left his hat behind. So in the morning I played it up. I saw the hat, and ran out the door yelling "Santa santa!!! you forgot your hat!" I came back in... "oh man.. what if santa flew around without his cap and got a cold and got sick and couldn't deliver presents to back home?" Her face got really serious for a moment, and then she laughed. I half think the laugh was because she realized I was joking, and half because she pulled one over on old dad and was enjoying it. My wife and I believe this is the last Christmas that the kids are going to believe in Santa because of the conversations we've been having. I know many folks don't believe in teaching their kids about Santa, and I have debated this with a friend a few times. However our household has taken measures this year, to make sure that their first Christmas away from home is a special one, and thus, it's not the year for them to stop believing. Which is why the debates they've been having have been so encouraging and fun. They are really trying to apply reason to this issue that is of the utmost importance to a young child. Which brings me to the debates on Santa Claus. We've had ongoing debates over the past few days, and I'll try to summarize them here. C-"How is santa claus going to fit down our chimney, it's small?" s-"he's got magic, besides he can come in the front door." C- "well that settles that question, but it doesn't settle what color Santa claus is." s - "in PNG, he's black." C - "no he's white"
C - "he's got to be white, I've seen him before in the stores." s - "that wasn't the real santa claus, the real santa claus is black"
Chad - "what color was Jesus?" S and C - "white"
Chad - "why do you think that? where was he from?" Chad - "and what color were people from there?" S and c - "we don't know"
Chad - "they why do you think Jesus was white?" C - "but Santa is from the north pole." Chad - "what color are Santa's elves"
Chad - "are elves big or small?" Chad - "what else is small?" Chad - "and what color are mice?" Chad -"so if elves are small, why aren't they brown?" S - "I don't know what to think about Santa Claus, I mean, a lot of my friends don't believe in him." C - "he's real, I know it." s - "yeah I know it too, because every christmas eve, I hear reindoor footsteps on the roof, but everyone else says he's not real"
C - "he's real alright." s - "yeah I know he's got to be real." C - "okay so that settles that he's real, but it doesn't settle what color he is." Chad - "we've never seen santa so how could we know?" s - "you could setup a video camera for when he comes?" Kendal " don't you think santa would know if you did that? After all he knows if you've been good or bad." C - "dad, I don't think you should put up a video camera, Santa will know and you won't get any presents"
S - "I know you can wrap up the camera and put it in a present under the tree"
C - "but then it would only take a picture of black." Chad - "does that mean santa is black?" s and c - "no, silly!!" C - "I don't think we should talk about this any more, Santa will know and then none of us will get any presents." and that ended the conversation... at least for now. the next debate.... why today (sunday) is called "Christmas Adam"
C - "it's christmas adam because Adam came before eve"
chad - "who came before Adam?" Chad - "then why didn't we call yesterday Christmas GOD?" Chad - "and who came before God?" Chad -"so who came AFTER eve?" S - "no silly, Father Abraham"
Chad - "no, their kids, two of which were named Cain and Abel. So why don't we call the day after Christmas, Christmas CANE?" S - "well, we do have a candy cane." C - "And jesus came after Eve, so Christmas is called Christmas Jesus!" Chad - "you guys do know that Christmas eve isn't named after Eve from the bible right?" C - "yes silly, it's a joke, we're making jokes." That was a load off my mind. one of the traditions we have in our house is to weekly light a candle in preparation for Christmas, and read some scripture verses around the table, celebrating Advent. It's a Scriptural preparation for Christ's birth, and what we're truly celebrating. It is a pleasant thing to see when your children spend more time talking about Christ and His birth than they talk about their gifts and what they might be getting. Each year, neither of them can come up with a list of gifts they want. It is part of the magic and the innocence of Christmas, that our kids still get. It has a lot less to do with what they might be getting. They write no letters to Santa, they make no lists, they do however, spend time reading their Bibles and wrapping gifts for others. It brings me a lot of joy to watch Christmas through their eyes. This year, it'll be different, but it should be very memorable. Thank you all for your contribution to it! the electricity here is provided via a hydroplant (dam) some miles... er.. kilometeres away. This country uses 3 phase power. I'm not an electrician, don't ask me to explain. many times a day we get under voltage (brown outs) over voltage (spikes), power outages and phase outages. This wreaks havoc on computer equipment but we've got systems in place to compensate. yesterday we got an over voltage so long, and so high, that the fans all began spinning faster than usual. One fan, spun soo fast, it began to whistle, and then, the blade flew off it's mount, hit the fan cage, rattled it loose, and sprayed plastic chips in all directions. Mind you the fan was mounted via a reverse threaded screw which is meant to tighten as the fan spins... so how this happened, we don't know. One thing that has been a huge adjustment for me personally, is being surrounded by constant need. What I mean by that is, every day that goes by, as I talk with people, I find someone who has a need. In the States, most people hid their need, or really didn't need. Here, people are constantly wondering how they are going to get along day by day. Many friends have strong financial need. As we talk on the roadways, or store aisle, that need is communicated and often through tears. We serve a miraculous God who can supply our need. The struggle is the process of waiting on Him to supply. Often people here are very tired of struggling, it wears you down, and tears are very near the surface. Today I spoke with a friend in dire straights right now, they've had break ins, and thefts, and translation issues, and they are having a very tough time. The part that I was not expecting here was to have my heart torn in so many different directions. I'm the kind of guy who likes to solve problems for people. It's why I am in the computer I.T. business. I like for people to look to me as a solution provider. But I simply can't meet all of the need there is here. I can occasionally help in one way or another, and as a family we can pray and encourage, but I never expected to have my heart broken for people on a daily basis. I'm sure there is some sort of survival technique you learn after being here for a while, but my entire life I've tried to avoid becoming apathetic, which means all to often, that empathy is the opposite reaction, and here empathy means feeling other's pain frequently. The only thing I can think to do most of the time is pray. It's the kind of environment that makes you want to give everything you have to help others. Today that means giving someone some cookies and a hug, while delivering the bad news about their laptop screen having died. What I want to do is give them a brand new laptop, but I can't. I can not solve this problem with my resources. heh heh, I didn't even bake the cookies, my wife did that! It really seems to me that all things come down to relying on God. "mom, I have a question, and it's kind of funny"
syd-"so, why did you marry dad anyway? Was it because you wanted a good laugh?" "mom, I saw a part of a movie yesterday and it was really wierd. These guys were wearing robes and saying all kinds of crazy words, and then they hit themselves in the head with a board. It was really funny." I laughed because I knew he was talking about a Monty Python scene. Calvin and Sydney were in a christmas chapel today. A one hour musical in which they sang songs of praise to Christ for His birth. It was a very lovely school event. It is such a nice thing to be able to walk 5 minutes up the road and attend their school functions, and to know I don't need to explain it to my manager because he'll be there too watching his kids. I saw a lot of imbalance in the Silicon Valley. "I think you should go home early." to every one of us.... I thought "this isn't early"
and I asked him, "why?" "It's Valentine's day. Work is important, and... I guess Marriage is important to." In his mind he was being magnanimous and giving everyone time off. In my mind, he had his priorities sorely out of whack, and a few hours of leaving work earlier wasn't going to fix it. Here, things seem to have balance. We take time to pray, we do daily devotions as a department, we do monthly prayer as a branch, we go to our kids school functions, and on weekends we rally around the youth events that are taking place. While it is balanced however, there is an added stress on the family of being outside one's comfort zone. Several of our friends have been having a really rough few months, and it is human to want to curl up into a ball during those times. We are thankful that we're looking at a new christmas this year. New adventures, new people, new happenings. It is for us, the silver lining in not being home. For some of our friends, however, it's really tough. Add onto that the hits that seem to keep coming at them, and suddenly their desire to return home becomes very strong. Pray with us this season for the fortification of the missionaries here. Pray that our home could be a warm blanket for those wanting to curl into a ball. Pray that we can be supportive and encouraging to folks who are tired of being here. And pray that God would breath new life into them, and if He so chooses, to use us to do it. Personally, I wish that I could somehow inject people with this enthusiasm I have for this place. Yes it wains at times when people expose their grumpy side, but that's part of life anywhere. If we could bottle up how glad we are to be here, it would be a good medicine for people. A lot of our friends right now need a "christmas miracle". They need an infusion of joy. The kids sang great this morning, it was the best Christmas gift to see your children praising God in song, in a community that praises God. Today was a day of unexpected blessings. It's Sunday here. First, to hear the Christmas Story in Tok Pisin. I was not expecting that, although years in the church I should have been expecting the Christmas story soon, but it snuck up on me. I learned a new term "bokis kaikai" it's the Tok Pisin term for "manger" and it means "food box" which is what the manger was, it was a trough. Somehow, hearing the Christmas story of Christ's birth, in a new language, had new meaning. I don't know if you're like me or not, but when you've been raised in the church, the holidays all seem to have a routine. It takes a serious commitment to not let yourself get caught up in going through the motions of celebrating Christ and to really let the meaning sink in. Hearing things in a new language, I didn't have to take the effort it jsut sunk in. It hit me in a new way. Like they said in church "long taim bipo, ol i no got tok save long tv o tok save long nuispaipa, tok save i kam long ensel" (back in Jesus' day, they didn't get news from the paper or tv, the Angel brought the news"
Secondly, I got to spend some time talking with my neighbor who has lived here for 24 years. He's a Papua New Guinean man, who manages a department here. It has been my pleasure to get to know him better, and to have him show me the ropes a bit this morning, was a blessing. Now, I have a trusted resource to talk to when I have questions about the culture. Many times, the question comes up "what is the right thing for me to do here?" Culturally it's hard to know what to do, and when you are trying to build a reputation as being trustworthy and helpful, you don't want to make a wrong impression or make a wrong move that could take a lot of time to fix. Thankfully, God sent us our neighbor John. It was good to talk to him today, and to realize that he is watching out for us. The other day I had a man come to my door, as they often do, to talk. What I didn't know was that this man was a well known liar, or con-man. My neighbor helped in that situation and shed light on things. Thanks to God for surrounding us with people to help us adapt. We typically attend church, enjoy the afternoon, then in the evening we eat pizza and watch a family film. Oh and last night we enjoyed our first STEAK here. WE've been avoiding the beef (except for ground beef aka "mince") because it can be rather chewy and taste gamey. But we decided to give it a go. I began the marinade the night before, put in some lemon juice for tenderizing, garlic, oil, vinegar, spices. Let it sit. Then in the morning I put meat tenderizer on it, and rubbed it in. In the afternoon I rubbed it with spices... and I figured, the meat had to be almost falling apart in your mouth now. I've never tenderized meat that much, because it would fall apart. Nope, while the flavor was great... the meat was REALLY chewy. Calvin seemed to really like it. It was a tasty meal. For those grillmasters out there, I will definitely need to tenderize this "steak" a lot more. IT was an odd cut I've never seen, so don't ask what cut it was. The meat cutters do things differently here. Even so, the flavor was good enough that it was worth the chewing. I think, the thing that most takes us "home" in our minds is food. Food is an adaptation here, but occasionally you get things jsut right and all the food tastes like home. Last night was one of those kinds of meals. Definitely being here has broken my love affair with food. Okay maybe not broken, but inhibited. One of the things they'd tell us is that we'd find it odd what we miss about food back home. For some reason I really miss Taco Bell burritos. I have NO idea why. I wasn't a HUGE fan before coming here. Today a few things hit me as I ponder the freedom's I've lost. I suppose maybe they aren't freedoms as much as they are conveniences. This week the aviation department discovered an engine problem in one of the planes and while it is being repaired, the plane is out of commission. There are no roads to get to the Port Moresby airport, so without aviation, we're somewhat stranded. Yes we could drive down to LAE and take boat somewhere, but it takes 5 days to get to Australia by boat, and that's after a 3 hour drive. So in a way, without the planes and helicopter, we're very stranded up here, although we're never truly stranded because there are multiple aircraft. With this particular craft however, out of commission, mail is slower, flights are rebooked, schedules are drastically changed, and people remember that flexibility is a very important attribute. Being flexible as you lose a convenience isn't a quality that I was necessarily born with. In the States, if someone can't offer you what you want, someone else can. Here, you're lucky to have it from a single source, and most likely you learn to do without. This is not the United States of America. There are things you learn to do without. There are a great many things here however, don't misunderstand me. It is not the middle of nowhere, we have conveniences. -Another freedom, or ability I should say, is earning power. Being a volunteer, dependent on the generosity of others, we have no ability to earn bonuses as is usual for me around this time of year. So as I'm sitting here pondering these, limitations, and wondering... why there is this gnawing feeling at me like something is wrong... in my mind Psalm 121 starts reciting. And it dawns on me, the part of this adjustment, is that I am losing some of my self-reliance. I am relatively powerless to make a plane engine start working again, to find a competing airline, to do many of the things that we rely on others to accomplish. And my attitude turns very quickly. Because I realize that I have been given the opportunity to apply Scripture in a very real way. To live it. In so many ways being here, doing this work, living this life, is a chance to apply God's Word in a new way. I am in fact blessed to be depending on God for these things, because I get to see Him deliver. He won't let us fall. We're trading a bit of self-reliance for God-reliance and while a somewhat uncomfortable transition, it is a trade well worth making. Now before anyone gets the impression that we're doing poorly in any way, let me belay those fears. We are not. We've been the recipient of such care and generosity and encouragement that our spirits are high and our hearts are full. What I refer to is the occasional moment where you are struck with the very real truth that without God's provision you would not be able to do what you are doing. And in that moment, there is an opportunity to recognize God's work. It is in this action that we can turn a struggle into an act of worship. My life this year, has not been forgettable. It has been a series of moments. Moments of great joy and of struggle. Moments where I seek God out to guide my family, and to give me the strength I need to continue. I think that this relationship, the discipline to turn to God and praise Him in every situation is what will keep the vitality of this ministry going. I thank all of those who are continually praying for us. It is sensed on this end. How? There comes a time every so often when a feeling or a thought hits you. It is a discouraging thought, and incapacitating thought, and yet, from somewhere unbeknownst to you, strength comes. A reminder of our God's greatness. It is in that moment that you realize someone out there is praying for you. And you have found triumph in the struggle because of it. I'm not being very specific I know because this doesn't apply to a specific instance, but rather to many instances that occur infrequently. new cultural experience - watching cricket... not sure what it is yet, but it appears to be a spectator sport. They have something called cricket 20 which is supposed to be a fast paced version of the sport. So now I assume the sport is typically slow paced. Still, when you see the fanfare of the NFL on a television and then the game is cricket, it's a bit of a let down. Sport is sport however and I will attempt to learn this game's rules. black santa claus - I instinctively want to say "African American" but a), they aren't African, and b) they aren't American. Seeing a Papua New Guinean dressed in a Santa outfit dancing around was an odd sight. Commercialism - this people of this country are cash poor, land rich. Land is passed down through the family and they make their living and their food from it. But they do not have a lot of cash. A television station entered the seen about 3 years ago, and thus commercials. This year, cell-phone service in parts of the country became available. So now, on t.v. and radio, there are lots of commercials of people dancing around looking happy and clean with cell phones. It strikes me as odd, however the people who work in town, are living a much different life. I saw a man buy carrots in town. This told me he did not have land of his own, and probably lives in town. There is a lot of new to experience although we've been here 10 months now. So much is new. Today at work, a team of us ran fibre cable to the primary school campus. I've never had the privilege of running underground fibre cable. We ran it through dirty muddy pipes into cement junction pits, and kept pulling and running it. It was a lot of physical work, but now the primary school will be able to connect to the backbone network more effectively. It made me think of some friends who recently went to Africa to do similar work. During the fibre pull, one of the guys said, "I heard a crack." That's not a sound you want to hear pulling several hundred meters of fibre, when you're on the last length of it. It means the cable might have broken (being mostly glass inside). So we tested it... THIS is the interesting part. We put a magnifying lense to the sun directing light into the cable, and then simply glanced at the other end of the cable (far across the center) and it worked!! I'm glad we prayed over that cable! It was my idea of a perfect day. Remember when you were a kid and the thunder storms came and you ran into your folks' room and asked if you could sleep with them? If that were to happen too frequently with our kids, we'd never sleep. Thunder is almost a daily occurrance during the rainy season. We live in a valley where the clouds gather and that atmosphere acts in such a way that thunder and lightning are common occurrances. The aviation guys could explain why and how it happens much better than I can. What I know is that at one moment I'm sweating from the sun, and the next I'm drenched from a sudden downpour. Add to this, that the roof is made of metal, and when it pours, it makes so much noise you can't hear people in the same room as you without shouting. As people walk about your house it is as if you are watching a pantomime. Our kids have always been good at not being scared at night. They both slept with the lights out since I can remember, and I can't recall a single time when they were scared and had to sleep in bed with us. This is a good thing because here, an average rain/thunder/lightning storm is worse than the worst one I can remember as a kid. The thunder shakes the house, the lightning, if it strikes nearby, can fry electronic equipment over the phone lines. Well, the kids go to sleep, and then my wife and I open the curtains, and sit down in front of our largest window, and watch the night sky. We watch the palms sway in the rain and sometimes wind. 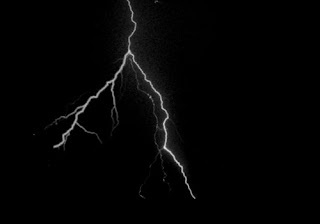 We watch the silhouettes of the night leap out as the lightning strikes, and then we count the seconds until the roaring thunder. It's energizing, it's interesting, and it's part of living here. I am thankful to God that our kids aren't skittish. He knew, and He prepared them.